Triangular prism - what's that? How to find the volume of a triangular prism with this tool? If you ever wondered how to find the volume of a triangular prism, this triangular prism calculator is the thing you are looking for. Not only can it calculate the volume but also may be helpful if you need to determine the triangular prism surface area. Choose the option which fits your needs and experiment with the tool! If you are curious about triangular prism formulas behind the calculator, scroll down to find out more. We are using the term triangular prism to describe the right triangular prism, what is quite a common practice. If you are looking for other prism type, check our rectangular prism calculator. But what if we don't have the height and base of the triangle? And how to find triangular prism surface area without all sides of the triangular base? Check out the other triangular prism formulas! In the triangular prism calculator you can easily find out the volume of that solid. A general formula is volume = length * base_area; the one parameter you always need to have given is the prism length, and there are four ways to calculate the base - triangle area. Our triangular prism calculator has all of them implemented, isn't it awesome? However, we don't always have the three sides given. What then? The only option when you can't calculate triangular prism volume is having given triangle base and its height (do you know why? Think about it for a moment). 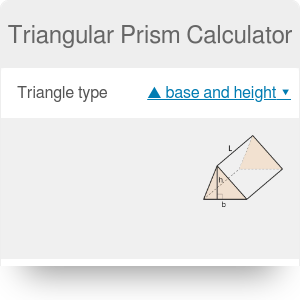 All the other versions may be calculated with our triangular prism calculator. Find out what's the length of the triangular prism. Assume it's equal to 80 in, type this value into the first box of triangular prism calculator. Choose the option with your parameters given. For example, given three sides of our base. Enter base sides. Our tent has a = 60 in, b = 50 in and c = 50 in. Triangular prism surface area and volume appear in no time. It's 96,000 cu in (55.56 cu ft) and 15,200 in² (105.56 ft²). Triangular Prism Calculator can be embedded on your website to enrich the content you wrote and make it easier for your visitors to understand your message.